The world’s largest municipality network on Thursday pledged stronger efforts to reduce greenhouse gas emissions for a sustainable future at a congress held in Seoul. More than 200 city representatives adopted the Seoul Declaration to outline the priorities for sustainable urban development at the International Council for Local Environmental Initiatives World Congress. With two main principles ― cutting carbon emissions and pursuing sustainable urban development ― the cities vowed to make eco-friendly and economically sustainable municipalities. The declaration is expected to serve as a guideline for cities seeking to reach the goals addressed in the Compact of Mayors. The compact, adopted at the United Nations Climate Summit in September last year, has stated the municipalities’ pledges to cut the emissions by 454 megatons by 2020. “The Seoul Declaration will likely influence the national governments to set up their post-2020 emission cut plans for Paris talks later this year,” said Seoul Mayor Won-soon, who was elected the ICLEI president on Wednesday. In December, countries are to finalize their post-2020 targets for cutting carbon emissions at the U.N. Climate Change Conference or Conference of the Parties 21 in an aim to limit warming to 2 degrees Celsius. This is to mark the first agreement joined by both developed states and developing countries. More than 30 countries, including European Union members and the U.S., submitted their cut plans as of last month, with more countries to unveil their schemes soon. South Korea has not submitted its plan yet. The cities will come up with more concrete plans to achieve the objectives of the declaration at the World Mayors Council on Climate Change on Friday. Five cities ― Paris and Nantes of France, Montreal of Canada, Johannesburg of South Africa and San Rafael of Argentina ― will also announce their own specific plans on cutting emissions, ICLEI officials said. The Seoul Declaration and the cities’ specific plans will be delivered to the COP 21. 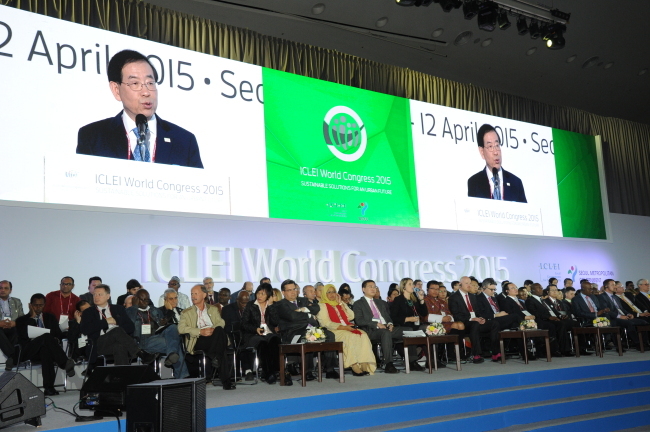 Since Wednesday, Seoul City has been hosting the ICLEI World Congress with 203 city representatives and 250 officials from international organizations, the largest number of participants in the organization’s history. The triennial event is held to promote cities’ role in tackling climate change and strengthen municipal cooperation.